A RCL-meter is used to measure resistance, capacitance and inductance. A very handy instrument that often is needed just once in a while, but rather expensive to buy. An alternative could be building one of the microprocessor based RCL-meter projects that can be found on the web. This is less expensive, but you need the skills (and time) to built it. But there is yet an easier and cheaper way! If you have PC with a suitable sound card, all it takes is handful of easy to find components, 10 minutes soldering and this application to build a RCL-meter for less than 10 € (or $). A cheap sources of 1 % accuracy resistors are metal film resistors of the "M" series (e.g. "MF12", "MRS6", "MFR4", ...). Metal film resistors of the "S" series (5 %) and most carbon resistors (5 % or 10 %) are not suitable. The 1 μF capacitors are needed to keep the bias voltage, that sound card inputs often carry for the use of an electret microphone or a microphone pre-amplifier, away from the measurement circuit. Be careful to connect the left (L) and right (R) channels correct (left channel is the inner connection of the plug). Use 3 individual shielded cables, the use of a 2 or 3 wire shielded cable will cause a significant degradation of the performance. Cable lengths should not exceed 120 cm (4 ft). The "line in" connector must be plugged to a stereo input of the sound card, the line in input (often marked light blue) should be preferred over the microphone input (often marked pink). The "speaker out" connector must be plugged into a sound card output (often marked lime green). Do not use the headphones connection of an amplifier (or "active speakers") as this can cause damage to the sound card. The connections to the DUT should be kept as short as possible and certainly not exceed 5 cm (2 inch). RCL-meter measures the complex impedance and calculates the resistance, capacitance or inductance of a component. The working principle is simple: an AC voltage of a known frequency is applied over a known resistor (R) in series with an unknown impedance (X). Based on the value of R, the voltage ratio (Ux / Ur) and the phase shift between Ux and Ur the unknown impedance (X) can be determined. So, apart from the reference resistor, one signal source and two phase sensitive voltmeters are required in order to measure impedances this way. Here a sound card is used as signal source (the speaker out) and the two phase sensitive volt meters (ADC's incorporated in the left and right line inputs). One ADC measures the source signal while the other ADC measures the signal over the DUT (Device Under Test). Knowing the exact value of R and the frequency of the signal source the value of the DUT can be calculated from the ratio of the amplitudes both ADC signals in combination with the phase shift between both signals. Although this sounds simple, it certainly is not. At the frequencies used to measure, the impedance of the DUT can be as low as a fraction of an Ω or as high as 50 MΩ. In the first case the signal over the DUT will be very small while in the second case both ADC values will be almost identical. In addition the input impedance of the sound card inputs is rather low, causing a relatively small unwanted impedance in parallel with de DUT. As a result the DUT will introduce only an extremely small amplitude change and phase shift. For example: Assume a sound card with a input impedance of 5 kΩ in parallel with 2 nF. 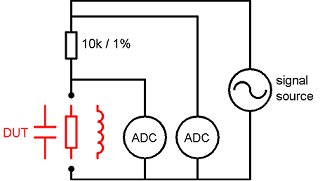 A 10 pF capacitor as DUT will cause an amplitude decrease of less than 0.001 % and a phase shift of about 0.01°. Such small amplitude changes or phase shifts cannot be measured directly. But it can be done by Fourier analysis of the signals and calculating amplitude change and phase shift from this data. 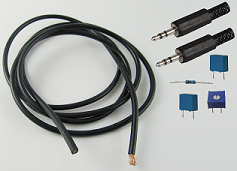 Resistance and capacitance measurements are performed at a frequency of 980 Hz, inductance measurements at a frequency of 11025 Hz (in order to allow the measurement of small inductances). Measured values in the range of 0.1 Ω - 99.9 MΩ, 0.5 pF - 99.9 μF and 0.5 μH - 99.9 mH are displayed, but very low and very high values should be taken with caution. Keep in mind that the RCL-meter performance is limited by the quality of the sound card. Furthermore all measurements are performed at audio frequencies. As a result the measurements may not be conclusive for high frequency applications of the DUT. This software is copyrighted freeware. This means that, although it is available for free, the author retains the copyright. You cannot do anything this software that is not expressly allowed by the author. You are allowed to use it and/or distribute the unmodified installation file free of charge. Any commercial use (including adding it to a commercial "software collection") is strictly prohibited without the prior written permission of the author. The author can not be held liable for any direct, indirect, consequential or incidental damages to other pieces of software, equipment, goods or persons arising from the use of this software and/or hardware. It is strongly recommended to read and understand the safety precautions before using the RCL-meter. RCL-meter is developed using the Lazarus RAD IDE. - The BASS.DLL library provided by Un4seen Developments. - A modified version of the Fast Fourier Transform algorithm Turbo Pascal unit written by Don Cross. The installation file is created using Inno Setup. Read the help file file for more details. Copyright © 2009-2016 by Rik Strobbe. All Rights Reserved.